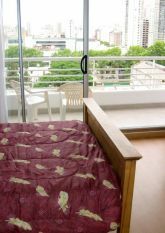 It has first class slipping window shutters that open to a nice balcony with open view to San Luis street. Ample , wide sight. Complete bathroom, modernly decorated, with tub and bidet. The bathroom has individual floor heating.Hair dryer. Complete Kitchen, with nice granite countertops. It is very practical. Gaz stove. Microwave. 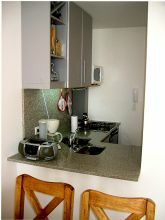 Electric coffee maker, toaster,fridge with freezer. The kitchen has individual floor heating. The main bed, measures 1,40x1,90 mts.There is also a futon (sofa) that can be easily transformed into a double bed. When it´s open it has the samen size as the bed. Tv. with cable, soon Internet available. Split air conditioning. Radio with CD. Bright and sunny apartment. San Luis is a very silent street. Electronic security case. The storing place door that faces the bed, has a big mirror. Black out in the big window. A place to love staying in !!! 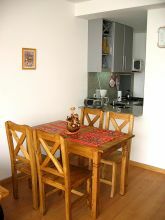 The kitchen has an open side towards the table, very practical!! Near to: Churches, Discos, Parks, Pools, Restaurants, Stores, Wash Stores, Bus Stop, Coffee Stores, Internet Coffee, Gyms, University.